Dislocation of the knee usually involves injury to both the anterior and posterior cruciate ligaments; associated collateral ligament injuries are common. Knee dislocations with injury to the posterolateral structures are among the most challenging problems that orthopaedic surgeons will encounter. In the acute setting, these injuries can present as frank dislocations or after spontaneous reduction. Late presentation involves chronic complex instability patterns in nonoperatively treated patients or following failed surgical treatment. 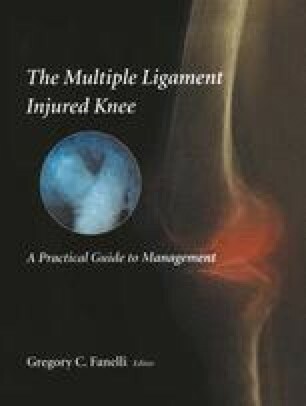 Knee dislocations can be classified based on the anatomic injury pattern.1 This chapter addresses the management of injuries classified as KDIIIL (see Chapter 3, Table 3.1), with the focus on evaluation and management of the posterolateral injury.